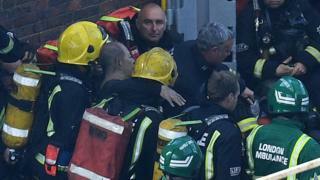 Hospital doctors are keeping some casualties from the Grenfell Tower fire unconscious for several days to allow them to recover from the effects of smoke inhalation. Doctors are currently treating 24 casualties in four hospitals: 12 are in a critical condition. All are said to be suffering from damage to the throat, lungs and airways caused by breathing in smoke. This is the major priority for doctors, rather than external burns. In fact, the BBC understands that no-one is being treated for burns to the skin or body. However, breathing in smoke can cause damaging internal burns and swelling to the throat, which may not be immediately obvious. The most serious cases will need a general anaesthetic. This means they can be kept well-hydrated using an intravenous drip and kept under close supervision while their airways heal. Most will also be suffering from carbon monoxide poisoning, caused by breathing in noxious fumes from the fire. They need urgent treatment with oxygen through a face mask. Breathing in concentrated oxygen this way enables the body to recover quickly when carbon monoxide enters the bloodstream. Babies, young children, pregnant women and people with asthma are most vulnerable to the dangers of carbon monoxide. Most people in big cities have a level of carbon monoxide of between nought and three, and smokers of five or six. After the fire, the Guardian reported that doctors were treating people whose readings were between 10 and 20. In total, nearly 80 people have required hospital treatment for the effects of the fire. At least 30 people are confirmed to have died. While treating the physical effects of smoke inhalation is a priority in the four London hospitals - King's College Hospital, Chelsea and Westminster, Royal Free Hospital and St Mary's Paddington - the psychological impact is not being ignored. Psychiatrists and chaplains have been on hand to help support the injured, relatives and staff. Survivors will have witnessed traumatic sights and many may also have to deal with the loss of loved ones. Prof Sir Simon Wessely, president of the Royal College of Psychiatrists, recommends turning to friends, family and religious leaders to talk through feelings. "While mental health professionals are invaluable in times of psychological need, immediately after a traumatic event it is our own strength, and those of our friends and family, that can be the most beneficial. "Speaking to a mental health professional - a complete stranger - when you are in a state of shock, is not always the solution." He said the public could play a part by offering practical support and information to those involved in the fire - as the community of North Kensington has been doing in force in the past few days.